The map below shows the LCTPC collaboration member institutes as listed in the second Addendum of the Memorandum of Agreement from 2008. 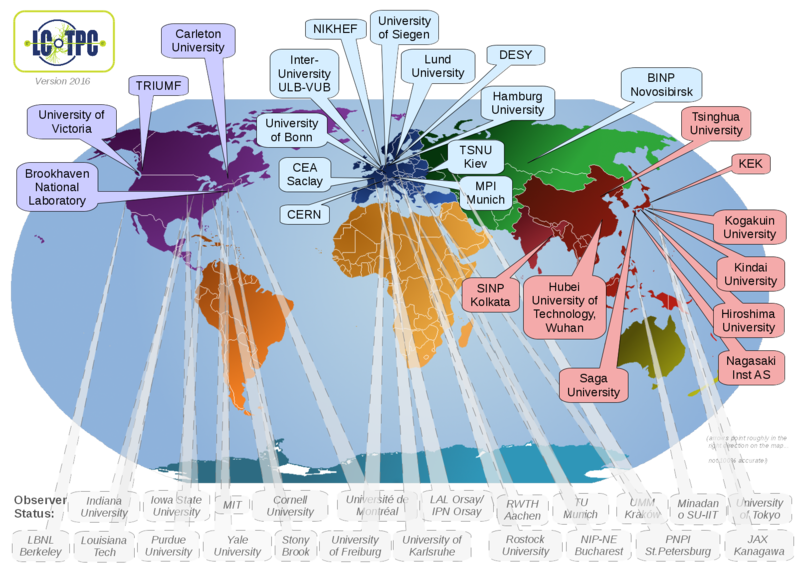 Below you find a table for each region with the member institutes and the collaboration board member from each institute. Besides the members listed in the tables above, there are groups or persons that could not sign the MOA but want to be informed on the progress and are included in the LCTPC mailing list. These observer institutes are: Iowa State University, MIT, Purdue University, Yale University, TU Munich, UMM Krakow and NIP-NE Bucharest.